*Note by Patty. Remember Slim? He came to me under the auspices of JMHA in the Fall of 2015. I did not get to keep him as long as I would have liked because it turned out he was a cryptorchid stallion (his testes did not descend properly) and not a gelding! He was super interesting and a lot of fun. Here are are some links to blogs about him. Slim arrives, Touching the Mustang, Halter on!, Mustangs don’t do gates, Slim is Cryptorchid or the Poop Wars! Slim at the start of his journey to life off the range, 2015. The Forest Service manages two Wild Horse Territories in NM: the Jicarilla and the Jarita Mesa Units. The Jicarilla wild horse herds range on 75,000 acres in the Carson National Forest, with access to an additional 32,000 acres of BLM land 16 miles northeast of Navajo Dam (Carracas Mesa). The habitat contains both desert and mountains at elevations of 6000-8000 feet. Forest Service feels 50 to 105 horses is the appropriate population size for this Unit, far fewer than the 600 that are currently estimated to reside there. The Jicarilla horses show the influence of Native American trading and our Conquistador history, and carry DNA markers of Spanish and Iberian Peninsula ancestry. 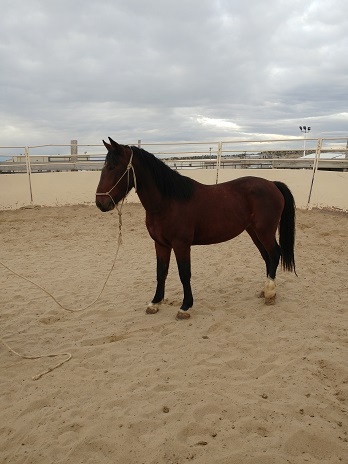 They stand 14-15 hands tall, are a wide variety of colors, and have proven to have willing minds, good conformation and are easily trained–like Seneca, a handsome eight-year-old who’ll be ready for adoption soon. The Jarita herds are located 20 miles northeast of El Rito on a mountainous 55,000 acres, also within the Carson National Forest. The colorful Jarita horse bands date back 400 years or more and also have significant Iberian markers in their DNA, although they tend to be smaller (12-13 hands) and lighter than the Jicarilla horses, as they carry pony DNA from the Isles (as well as some idiosyncratic Clydesdale markers!). Many believe they were first brought here by Juan de Onate around 1598. Certainly, the history of the herd is tied to the Hispanic communities which have also been there for over 400 years. The Forest Service feels this area can appropriately support 20-70 horses, and estimates there are currently about 100 horses there. Bait trapping is the primary method used to catch horses for relocation to Forest Service adoption facilities, but there are more horses than potential owners. That’s where JMHA comes in. JMHA adopts horses from the Forest Service, then facilitates training and placing horses in appropriate, permanent, homes. 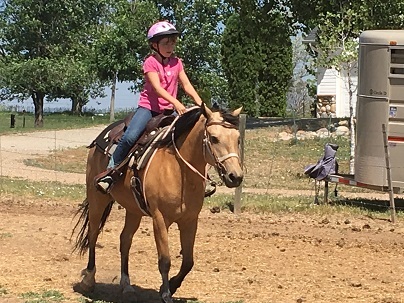 JMHA takes pride in helping match each horse with the “right” person and has helped train and find homes for 50 mustangs over the last six years. JMHA relies on volunteers and donations. Part of JMHA’s fundraising includes an annual Poker Ride and Obstacle course competition, horsemanship clinics, and tack sales. In 2019, they will also host a magnificent ride at a beautiful ranch in Chama, NM. *Note by Patty: I am giving a clinic there in June, if all goes well, called “Practical Trail.” Once the details are settled, I will be sure to make a Big Announcement! JMHA says that adopting a mustang is a good choice! 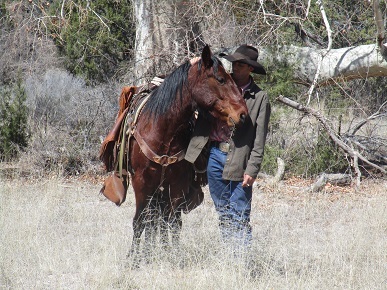 Adopters are often impressed by their calm and gentle personalities and by how quickly the Jicarilla mustangs learn. (The Jarita horses are hotter.) They can make great kid’s horses, and mustangs in general bond strongly to their people. Mustangs are also trail-wise (how could they not be) and are easy keepers. Not sure if a mustang is for you? Contact JMHA and they’ll help you decide if a mustang would be a good fit. The JMHA web page is here, and they also have a Facebook page. 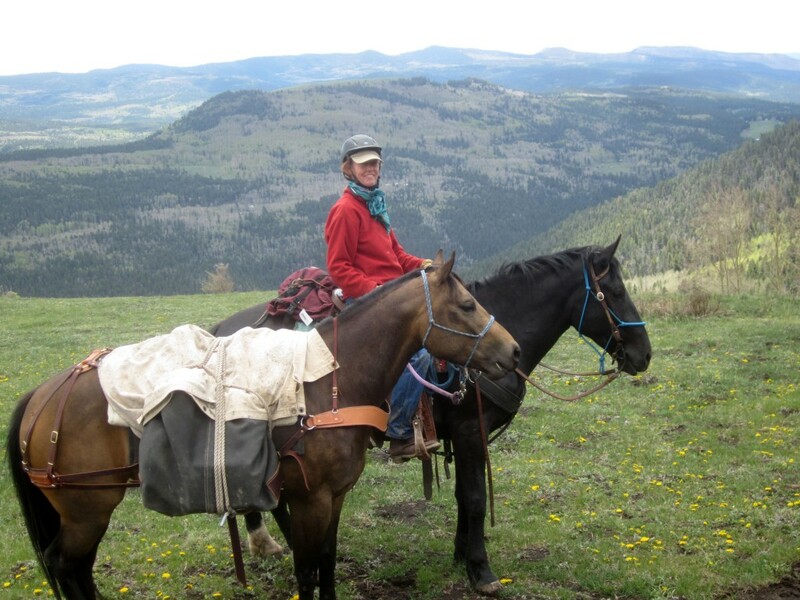 *Patty says: I have done saddle training with one Jicarilla Mustang, named Carson, for JMHA’s executive director, and he lived up to the calm, gentle and trail savvy claims. He did a great job for me, as a green horse, on a BCH trip, in quite bad weather, with lots of dead fall. 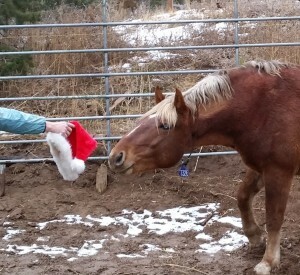 Carson, a Jicarilla Mustang, and Lacey. Before the storm came in!